A sharply dressed woman with a pixie cut gathered the contents of my purse that had fallen on the ground and handed it back to me. Her lips formed shapes, but I couldn’t make out words. I tried to make sense of my phone. I fumbled through screens with my finger that no longer felt attached to my hand. “Hey, I passed out on the subway at 14th street. Can you come get me?” I think I managed to get out. I sat there dumbfounded. I had been on my way to work listening to an audiobook and a wave of nausea overcame me. I was packed between a cluster of morning commuters when the nausea turned into colors. The subway doors opened, and I stumbled through briefcases and coats. I tried to maintain normalcy as my vision left me, but I tripped over something hard and fell. Cold metal hugged my face, waking me up. I will simply say that there was a lemon in my life that was making me increasingly bitter. Many people have them, whether it comes in the form of an unhealthy work environment, a toxic relationship, or an addiction to a substance. Whatever the case, this particular lemon was growing rapidly. The bitterness spread to my daily conversations, and it altered my general threshold for happiness. After stewing on the subway incident for a few days- I decided two things. I would always listen to my body, and I would quit my job. So, I typed out a resignation email with an emphasis on each period. When I pressed send, I sent my bitterness with it, hidden between the lines and in the punctuation. I felt immediate relief. Despite the fact that I had no job lined up and no real plan; I was free. Timing couldn’t have been better, because it so happened that my roommate was battling some lemons as well. Of course we also had rent, bills and no income. So began the brainstorming in the breakfast nook of our Midtown Manhattan apartment. I cracked open my laptop and Google’s cursor eagerly waited. “Highlights of Asia” greeted me with 218,000,000 results. Once I discovered my Delta Skymiles covered the cost of my flights, nothing was left to hold me back. So we quickly posted our apartment on the interwebs and started planning the month-long backpacking trip. Two weeks later I found myself sleeping in a 3-by-7-foot capsule in Tokyo and I welcomed the ambiguity of the future without hesitation. We watched robots battle in a haze of lights at Robot Restaurant, navigated the subways, ate our way through the world’s largest wholesale fish market, and indulged in the freshest sushi of my life in Naha. Then we hopped over to Vietnam where we crawled through the Chu-chi tunnels, tried on vietnamese hats while drinking fresh coconuts, learned to make spring rolls at our homestay on the river, and admired all the street performers in Hoh Chi Minh. We said goodbye to Vietnam as we made our way to Cambodia. Hundreds of Tuk-tuks surrounded the airport and we knew we were in for an adventure. We bussed our way to Siem Reap and enjoyed pool-side bar trivia at our beachy hostel. The following morning we rose early to witness the sunrise over the ancient ruins of Angkor Wat. After a day of playing tombraider we decided we needed some beach time and headed south for the enticing island of Koh Rong. We realized island life agreed with us as we treated ourself to fresh seafood with our feet in the ocean, swims with glowing plankton, and a casual climb up to our treehouse bungalow with views of the waves settling into the shore. Finally, we made our way to China to walk the Great Wall and explore the crowded streets of Beijing and Shanghai. Each country we encountered brought new sensations, and Instagram worthy moments. We filled our days scootering around temples, snorkeling through coral reefs, and floating through markets in the Mekong Delta. By the time we were navigating the mysteries of the ancient ruins at Angkor Wat, I knew I wasn’t ready to go back to New York life. At least not yet. I solidified my plan to keep traveling solo as I kayaked around the islands of Koh Rong. Back on land, I remembered I still had my lemons to deal with. 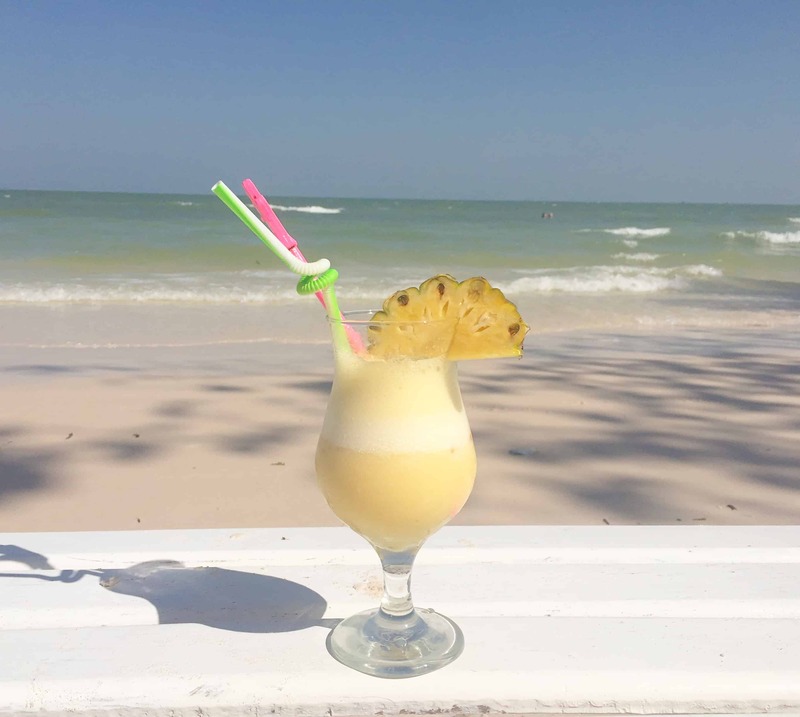 So I indulged in a $3 Pina Colada on the crystal clear beach, and let the idea of Thailand wash over me. I said goodbye to my roommate and I landed in Bangkok with an open mind, and without a plan or a ticket home. I was determined to push myself out of my comfort zone. I made it a few hours solo, before some Finnish backpackers invited me to explore the temples of Bangkok with them. As we watched the monks scurry inside glistening doorways and the sunset over the pillars of Wat Ratchabophit, I laid my fears to rest. That night I snuggled into my bunk bed in the 24-person-dorm amongst like-minded travelers and nomads, and realized I was home. Eventually, I traded the buildings and city lights of Bangkok in for the quaint jungle town of Chiang Mai. As I settled into my boutique hostel, I met other travelers who wanted to trek into the unknown. So I set off on a 5-day jungle trek with 4 strangers and entrusted my life to the knowledge of the local Thai guides. We bushwhacked our way through bamboo groves and banana trees, across rickety bridges and through villages with elephants bathing in the mud. After Chiang Mai, I made my way to Khao Yai National park where I gushed over wild crocodiles, elephants, monkeys, and snakes. Then I decided it was time to gain a new perspective underwater. So I bussed and ferried myself to Koh Tao Island to get Open Water Scuba Certified. Once I felt the ease of life undersea, I couldn’t stop. Three days turned into 5, and that turned into 8 by the time I hopped on a live aboard scuba diving boat on the Similan Islands. Suddenly I was marveling at giant manta rays 3 times my size and taking selfies with sea turtles. Any doubts I ever had about the importance of traveling, subsided with my air bubbles. For 30 days, I trekked, scuba dived, scootered, ferried and bussed my way from Pad Thai to Pad Thai. I spoke of political ideologies with Europeans, Canadians, and Aussies over wine. I found my glass to be endlessly full of meaningful conversation, solitude, and peace. As I packed up my backpack each morning, I wondered if I had the ingredients for a Pina Colada all along.